I’ve been a fan of STM products for a while — they make rugged, hard shell cases to protect iPads of all iterations. 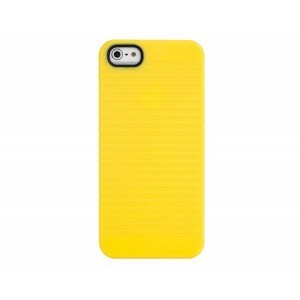 But I recently came across their Grip for iPhone 5. It is indeed a hard shell (polycarbonate plastic) with just the slightest bit of flexibility, with a raised bezel to protect the screen if you happen to lie it down on its face, which I’ve been known to do. But what’s cool about it is that while it has ridges (hence, the “Grip”), it’s amazingly lightweight and adds almost nothing to the weight of the phone itself. The truth is that once you buy a good phone case, it should do its job without reminding you it’s there every time you pick it up. For those of us who travel a lot and like to shove our phone in the nearest pocket or sleeve of a backpack, it’s a clear winner in the phone case race. Amazon has the STM Grip for $20 in a range of colors. LOVE love this color. The grip is good because I always drop my phone on a regular basis and $20 is not bad all plus you can take it off and clean it. Nice post.